It is unfortunately time for The Good Place season finale. It has been a crazy season with lots of traveling and growth for our characters. Chidi and Eleanor are finally happy and together! But their relationship is painfully short-lived. When we left off last week, Michael was having a mental breakdown from the pressure of having to play architect again to a new group of humans so Eleanor takes over for him. Turns out, she really isn't so bad at this whole architect thing! Before she became a good person and all she was an excellent liar, a habit that comes in handy as she shows John Wheaton around. Wheaton is an annoying, Perez Hilton-lite, gossip columnist who used to ridicule Tahani on the regular on his blog, Gossip Toilet. This revelation coupled with Simone's arrival (yes, Chidi's ex, Australian Simone, that Simone) makes the gang realize The Bad Place chose the new recruits specifically to mess with each human. The Judge rules it's an acceptable move, no one ever specified they couldn't do that after all, but she also allows Michael to erase Simone's memory so she won't remember any of them. But Chidi will. And Chidi realizes that he needs to have his own memory erased to ensure he doesn't mess up the experiment somehow. It is the fate of their eternal souls on the line, after all. Eleanor and Chidi share an emotional final day together, complete with their own memory montage film that Michael pieces together for them (yes I cried). "We found each other before, hundreds of times. We can do it again." I sure hope so. When all is said and done, Eleanor is reeling from the loss of Chidi. Her happiness was so fleeting and when you think back to a couple episodes ago and remember how upset Eleanor was about being happy because the idea of losing him was terrifying, it makes Chidi's memory loss all the more heartbreaking. Janet is a welcome comfort to her as she struggles with the meaning of the universe, an answer to life and the point of existence as a whole, especially when such pain and loss is possible. They discuss pandemonium, and finding meaning in the chaos. It is a very poignant conversation and one full of hope. 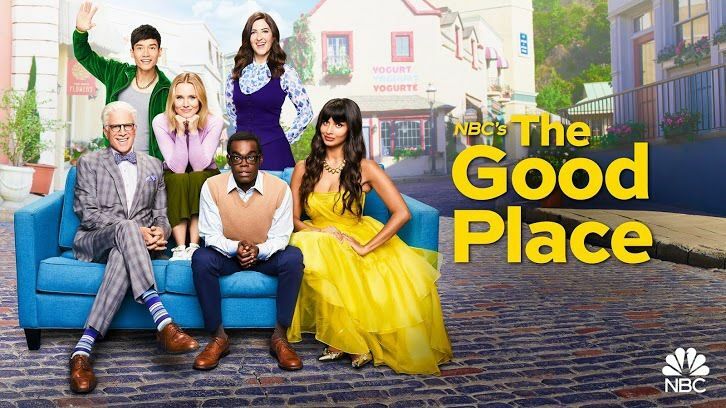 When Eleanor is finally ready, she opens the door and welcomes Chidi to The Good Place. - This exchange - John: Okay, what's the craziest secret celebrity hook up? Janet: Drake and Ruth Bader Ginsburg, on and off for years. BONUS - Tahani: I haven't met a more perfect couple since I set up Drake with Ruth Bader Ginsburg. - I'm so proud of Eleanor for remembering Paradise Lost and of Tahani for trying to be a better person, even to someone as irritating as John. Somehow she even refrained from pouring a drink on him when he said, "Oh, my God. You are so cute. You are so cute, it's gross. You disgust me. I love you. Get out of here. I never want to see you again. I love you so much." - The fact there is an ice cream flavor called "male-coworker-gets-called- out-for-stealing-your-ideas". Can Ben & Jerry's please get on that? Also can we get a listing of all the other flavors in this place? - Is Chidi actually Eleanor's Shawn-pick or will she get another one? Can you imagine if it's her mother? Also who will be Jason's!? Any guesses? The Good Place will return for a fourth season on NBC.